Here you will find an brief descriptions of the facility and amenities at the Kellogg Eye Center in Ann Arbor. The Welcome Desk is the first place a patient or visitor should go when arriving at the Kellogg Eye Center. Our friendly patient services assistants at the Welcome Desk will direct patients to their clinics. There is an ATM located on the mezzanine level in the dining area. Free, public wireless Internet access is available in nearly all U-M Health System facilities. Through this network, you can use your laptop or mobile device to access the Internet from waiting areas, the 20/20 Cafe, and other locations. Please do not use the network while you are in an exam room. The wireless network is called "MGuest-UMHS." Start up your laptop or mobile device, and enter the address of any Web site. You'll be redirected to a login page. On the next page, click "Continue" and you will be directed to the Health Systems Web site. You can explore our site, or go to any other Web site by typing in the address or using your own "bookmarks" list. Hours: Monday through Friday from 7:30 a.m. - 3:00 p.m. Located on the mezzanine level of the Eye Center, the 20/20 Café provides patients and visitors with a variety of delicious menu offerings. The chefs work extensively with MHealthy dietitians to create full-flavored healthy dining options. The 20/20 Café is operated by the Picasso Café, Inc. These links will take you to the Maps and Parking section of this website. 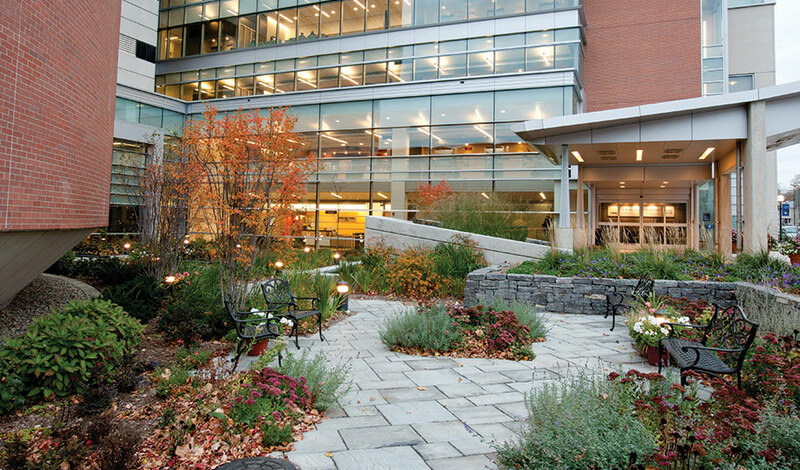 The Helmut F. Stern Garden was designed as a place of beauty and serenity for our patients and their families, with a work of sculpture commissioned for its centerpiece. The sculpture incorporated in the garden’s water feature, entitled “Gathered Sounds,” stems from visual elements created in response to sounds in nature. Adding another dimension of interest, especially for those with impaired vision, the garden immerses its visitors in a sensory experience, with birdsongs, fragrant flowers, and the sounds of falling water. Clinical trails are conducted at the Kellogg Clinical Research Center, a 5,000 square foot research unit located on the 5th floor of the Kellogg Tower. The KCRC provides infrastructure, services for investigators who conduct research, and resources to support patient-oriented research studies. The Optical Shop is located on the first floor of the Eye Center, directly behind the Welcome Desk. Our opticians custom fit eye glasses that correct for all prescriptions. The optical shop carries many designer frames in the latest styles. Turnaround time for most prescriptions is 3-5 business days. There is a 20 percent discount and payroll deduction for U-M employees. Hours: Monday through Friday from 8:15 a.m. - 4:45 p.m. The Kellogg Eye Center Pharmacy's prescription drop-off / pick-up window is located in the 4th floor waiting room of the Brehm Tower. The pharmacy carries many prescription ophthalmic drops and ointments along with prescription oral drugs most often used to treat ophthalmic conditions. The pharmacy also carries a small selection of over-the-counter products. Prescriptions for clinic patients will be sent electronically or faxed to the pharmacy by their Kellogg Eye Center doctor. Alternatively, a patient can drop-off a written prescription at the pharmacy following an appointment. Surgery patients can drop-off written post-operative prescriptions at the pharmacy to be filled. Prescription insurance cards should be presented when arriving at the pharmacy to pick up a prescription. We are a smoke-free environment indoors and out in the interest of our patients, families, visitors and staff. Information about our Smoking Policy -- including a map of the outdoor smoke-free areas -- is available on-line.